The Rose Heyworth Colliery was sunk in 1874 under the directorship of Mr Lawrence Heyworth Managing Director of the South Wales Colliery Company. The Company already owned Cwmtillery (The South Wales Colliery) and the first coal raised at Roseheyworth was in 1876-77, though may well have been later as it is not on a list of Collieries producing coal in 1879? Its opening came fairly late in the development of Abertillery, large scale mining in the area had started in the early 1840s with the sinking of the first deep mine at Cwmtillery by Mr Thomas Brown and the development of the Penybont Tillery Colliery in 1848-50 by Messrs Price brothers. The family residence situated off Todmorden Road Greensnook House was the home of Mr Lawrence Heyworth senior. Mr Lawrence Heyworth Snr was born in 1786, the youngest of four sons born to Mr Peter Heyworth and his wife Elizabeth who was the daughter of Mr Lawrence Ormerod of the same place. Both sets of grandfathers were the principal cotton manufacturers at Bacup. He went to the old school in Bacup which stood where today’s Mechanics Institute and Library now stands. A turnpike road ran through the estate, Mr George Ormerod of Greensnook and John Ormerod of Bankside were trustees of that road. In 1802 he left school in Halifax being then sixteen years of age and went into work with his brothers who succeeded their father in the woollen business. At the age of nineteen in October 1805 he left Bacup by stagecoach bound for Lisbon, travelling through Birmingham and Bristol, the last leg of the journey was at night. Inside the coach was one fellow passenger, sat on opposite sides to one another each had their windows open. In the morning with a frost on the ground they both expressed how cold they were and each explained that he had kept his window open thinking the other wished it. This led to a firm friendship developing between the two. His companion was a young German by the name of Grunin a traveller for a commercial house in Hamburg and himself on his way to Portugal but he was first to visit London. Thinking they would not meet again on parting they said their goodbyes this would prove to be untrue. Whilst waiting for a suitable passage news came from Trafalgar and the death of Nelson. Accidentally Mr Grunin put-up in Mr Heyworth’s lodgings after changing his mind to travel to Portugal instead and they shared the same passage to Lisbon. Introducing him to the many merchants of the place Lawrence speedily received many orders not only for goods that the Heyworth’s produced but for other articles that he would take a commission on for supplying. Lawrence remained abroad for several years arriving in London he boarded a ship for the continent and opened up trade with the merchants of Spain and Portugal. On his return to England in 1819 he bought Yew Tree estate near Liverpool and married his second cousin Elizabeth Aked in 1820. They had six children, Lawrencia born Oct 1821, Peter George born June 1823, John born Oct 1824, Elizabeth born Oct 1825, James Ormerod, Born July 1827 and Lawrence Heyworth Feb 1831. In 1848 Mr Lawrence Heyworth became M.P for Derby, after sitting through two parliaments extending over a period of about nine years he resigned his seat in 1857. Mr Lawrence Heyworth was the President of the Mechanics Institute from its opening in 1839 to his death in April 1872 aged 86 years. His daughter Lawrencia married Richard Potter in 1844 and they had ten children the most famous of these being Martha Beatrice who would marry Mr Sidney James Webb in July of 1892. Beatrice visited Bacup in 1883 following the death of her mother who had died the year before. Christ Church was built in 1854 on part of the Greensnook estate paid for by a bequest of the late Mr James Heyworth of Rosehill, Bacup, afterwards his nephew the Rev James Heyworth M.A of Bristol was the first patron. Greensnook House was occupied by Mr W. J. Sleath in 1849 after the Heyworth’s had left the district. In those days it was a treat to go around the grounds of the mansion. Mr Sleath was for a time partners with Hamilton’s of Grove Mill. Mr Sleath retired to the South of England were he died in 1881. Mr Lawrence Heyworth Jnr and Family. Mr Lawrence Heyworth was born on 15th February 1831, the youngest son of Lawrence Heyworth, a merchant, land and railway proprietor and Member of Parliament for West Derby in Liverpool, who resided at Yew Tree Manor, Walton-on-the-Hill, Lancashire. Like Lawrence Heyworth senior, his wife-to-be (Rosina Kate Mortimer) was from a wealthy background. Mrs Rosina Kate Heyworth nee Mortimer. Miss Rosina Kate Mortimer was born on 19th August 1844 and baptised just under a month later at the Army’s Chaplin’s Station in Mercara (now, Madikeri), in India, an area some refer to as the Wales of India with its misty hills, lush forests, and breathtaking views. Her father Mr John Basterville Mortimer was a Lieutenant in the British Armed Forces and after he died, her mother Susan (nee Payne) married banker and magistrate Mr John Bates in 1855. In 1861, Miss Rosina Mortimer lived with her mother and stepfather at 6 Royal York Crescent in Clifton, and in late 1864 she married Mr Lawrence Heyworth junior who had carved out a career in the army. By 1871, the couple were living at Risca House in Monmouthshire where Mr Lawrence Heyworth is listed in the census as a J.P. and a Captain in the Royal Glamorgan Militia, later ascending to the rank of Lieutenant Colonel in what became the 3rd Battalion, Royal Welch Regiment. He also became the Chairman of the Crumlin Viaduct Works in 1872. In 1872 Lawrence Heyworth became the Chairman of the Crumlin Viaduct Works and was financially involved in the Argentinian Railway Company. Several years earlier he had become Chairman of the South Wales Colliery Company, which had been originally established by Mr Crawshay Bailey, Mr Kennard and Mr Thomas Brown Esq in 1864 to purchase the Cwmtillery Colliery – Ty Nicholas from Mr John Russell Esq of Risca. Mr Russell was also involved in the company in some way and his daughter Ellen had married John Selwyn Payne, Rose’s uncle. The Roseheyworth Colliery Planning and Construction. In December 1873 Mr Lawrence Heyworth ventured out to develop a colliery in his own name, he entered into negotiations to buy land from the Nantyglo and Blaina Company, from the start of the development he decided to call his new coal mine “Rose Heyworth Colliery” after his wife Rosina Kate Heyworth and in January 1874 he put out tender notices in the “Monmouthshire Merlin” to builders for walls, sidings and the yard to be built and on the 14th March 1874 he put out tender notices in the “Western Mail” to contractors for the sinking of the “new pit”. The sinkers for the Roseheyworth Colliery were housed in specially built wooden houses on the bank close by where the park is today. They were 3 blocks of 4 houses, while later many of the original workers at Rose Heyworth colliery were housed in new cottages designed by Mr Lawrence Heyworth. These were called Clyn Mawr Cottages, named after the area Clyn Mawr, upon which stood the 3 Clyn Mawr Farms, Clyn Mawr Uchaf, Isaf and the middle Canol farm. These rows later became known as Newtown and finally Blaenau Gwent Rows, as they are today. In 1896, there were 1,625 men producing coal from the old coal, three quarter, big, and elled seams at Rose Heyworth and Cwmtillery. Messrs Lancaster & Spier (Messrs Spier was a Lancaster family member) took over the Colliery in July 1888. The company leased the Cwmtillery and Rose Heyworth Collieries and was separate to the Messrs John Lancaster Co of the Blaina Collieries. This Lancaster-Speir partnership only lasted a short while and the Lancaster Co took over control until 1915. The Death of Mr Lawrence Heyworth. The Ebbw Vale Company take over. In 1915 the Ebbw Vale Iron and Coal Co took over the Collieries belonging to Messrs Lancaster & Co. In December 1915 it was announced “Herald Of Wales” that the interests of Messrs D. Davies and Sons (Ltd) in Messrs J. Lancaster Steam Coal Collieries in Monmouthshire had been acquired jointly by the Ebbw Vale Steel Iron and Coal Co Ltd and Messrs T. Beynon and Co Ltd of Cardiff. The Ebbw Vale Steel Iron and Coal Company Ltd. Messrs J. Lancaster Co owned about 4,000 acres of colliery property in Monmouthshire and Messrs Davies and Sons Ltd represented nine-tenths of the shares of the company. The sales agencies already held by Messrs Beynon will give them control of sales amounting to about 5 million tons per annum which placed the company in a foremost position in South Wales. The Ebbw Vale Company’s property adjoined those of the undertakings acquired and was a considerable advantage in working the two companies together. By 1918 the joint workforce at Rose Heyworth and Cwmtillery Collieries stood at 2,760. Thereafter, problems in the coal mining industry and the general economy led to a decline in fortunes such that by 1938, only 804 men were employed at Rose Heyworth, which fell to 754 in 1945. After the war, Rose Heyworth Colliery fortunes recovered following nationalisation. The Ebbw Vale and Lancaster Colleries employed about 20,000 men. Messrs Richard Thomas & Co.
A total of 20,000 cans were distributed among all Richard Thomas employees in England and Wales and were given out with each man’s pay. 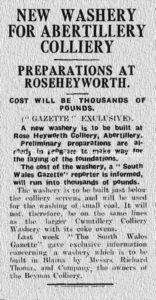 In January 1937 Messrs Richard Thomas & Co announced they were to build a washery at Rose Heyworth Colliery (as seen in the advertisement left). The washery was to be built south of the Colliery Screens and is seen on one of the old images of the colliery. 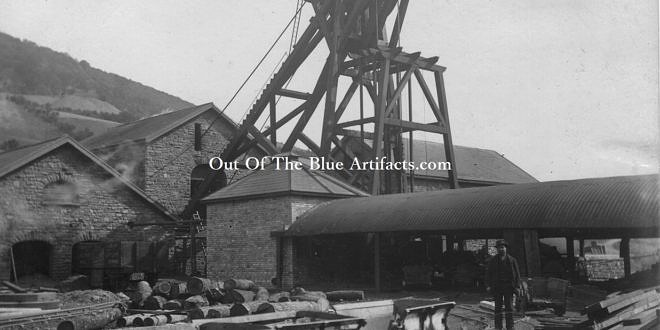 The Company also stated a similar one was to be built at their Beynons Colliery, Blaina. The new washeries to be constructed would save the company the trouble in having to transport the coal and muck to the Cwmtillery Washery. Prior to this all coal mined at both collieries was transported by rail down the valley and up to Cwmtillery. This new washery was only operational for about twenty years as in the 1950’s the collieries were modernised and a new Coal Preparation Plant and Drift was constructed, as seen below. In 1947 the N.C.B. took control of all the collieries in the UK after the nationalisation of the industry in that same year. Rose Heyworth Drift and Washery. On Thursday 5th July 1956 the Western Mail Newspaper reported on the proposed £3,000,000 link-up of the Cwmtillery and Rose Heyworth Collieries via a drift 1,000 yards long with a 1 in 5 gradient. It was said that the project would take 2 years and increase output by a third. In 1955 the output-a-manshift at the Cwmtillery Colliery was 23 cwts, which was said to have been above divisional average. The output-a-manshift at Rose Heyworth Colliery was 18.4 cwts, it was said the figure for the integrated pit could be 30.1 cwts. The report also stated that the vast supplies were to be used at the Ebbw Vale Steelworks owned by Richard Thomas and Baldwins Ltd. In 1948 a new housing estate was planned with many of the houses and flats were built in so-called Cornish style with the avenues being named after local and national politicians, hence Attlee Avenue (Clement Attlee, British prime minister 1945-50), George Daggar, George Barker and Brace Avenues (after local MPs). Smith Road was named after Mr David Smith, Colliery under-manager and councillor. I believe Lawrence Avenue was named after Mrs Susan Lawrence another M.P of the time. In 1959, Rose Heyworth mine was integrated with Cwmtillery to become Abertillery New Mine after a new drift mine was driven 1,200 yards at a 1 in 5 gradient to raise the coal from the two pits. 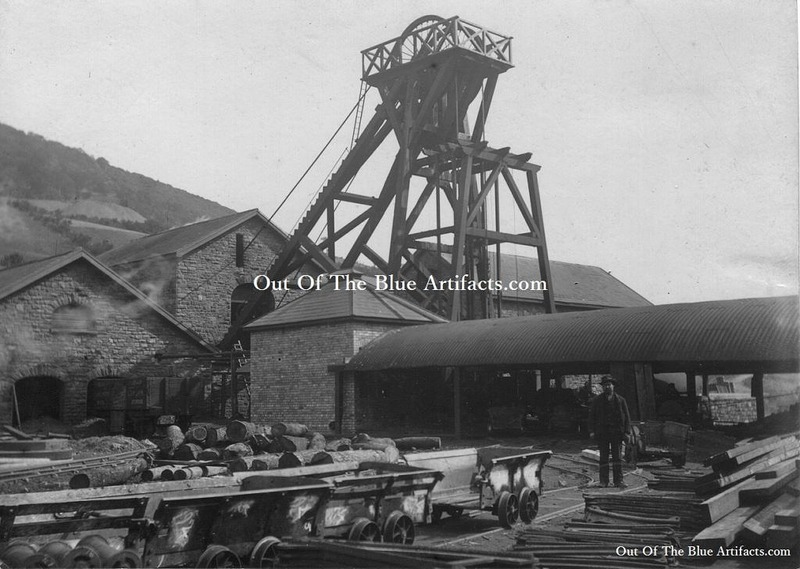 Coal from Blaenserchan Colliery was also brought to the surface for washing and preparation using the same drift. In the late 1960s, there was more pressure to house people in the area in new housing and more farmland just to the north of the pit. In 1970, construction of the Arael View estate began, building just under 100 new houses in what was considered a radical architectural style. The bottom housing site was originally planned for double the size though the ground to the north was too boggy and the plans were dropped, the housing site is only half finished. The local grammar school under the comprehensive education reorganisation in 1971 became Rose Heyworth Junior Comprehensive School which it continued to be until the mid-1980s when it was shut under yet more reorganisation with pupils moving to Abertillery Comprehensive in the Tyleri Valley. Rose Heyworth Colliery was sadly closed on December 20th 1985 following the previous year long miners strike and defeat by the Margaret Thatcher Conservative administration and officially wound-up on the 1st January 1986. At the time of closure there were about 450 men employed at the colliery above and below ground. Even though the pit closed, the Rose Heyworth name lives on in the area, e.g. the local primary school was built just south of the old colliery, it is named Rose Heyworth Millennium Primary School. Nowadays, the name Rose Heyworth has become a household name, that of a woman who was born in India in 1844, has given itself to a colliery, schools, houses, a social club as well as that general area of Abertillery but in most minds the origins have been lost in the midst of time. An old image, one of the earliest known to exist. It shows the original layout of the colliery bank, the wooden headgear, flat ropes and winding house. In the distance can be seen the waste tips of the Coed Cae Tillery Levels that was located by what is now top Arael View.